The connected television is the preferred platform to enjoy online video streaming. 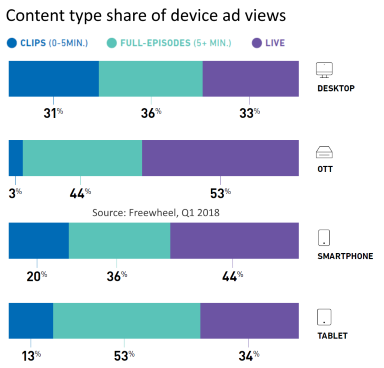 According to Freewheel, 40% of online video ad views go to the connected TV, 28% to the desktop, 21% to the smartphone and 11% to the tablet. 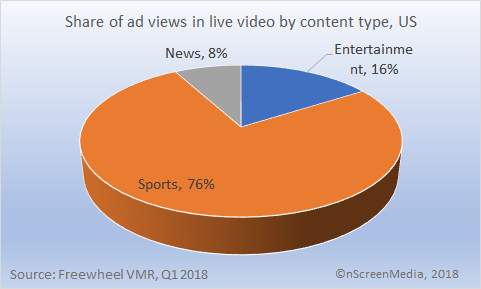 Live content drives the most ad views on the connected TV. 53% come from live viewing, 44% from full episodes, and just 3% from clips. Live viewing on the connected TV is far higher than on the smartphone, 44%, and tablet, 34%. 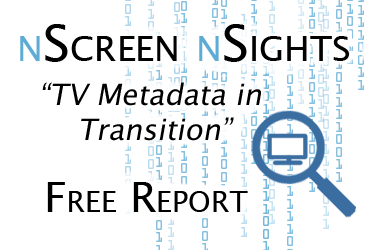 nScreenMedia’s analysis of Conviva data confirms that the connected TV and live content seem to be a match made in heaven. Average hourly live video play requests per unique viewer increased from 3 in 2016 to 4.6 in 2017. Live video consumption continues to grow strongly online. With its increased availability in vMVPDs and TV Everywhere apps, sport is a key driver of this trend. The most popular platform to stream live video is the connected TV. Freewheel includes payTV STB VOD ad views in their diagrams and discussion. I have removed that data to focus on the online video ad views.